The way you run your business and the way you eat are deeply connected. Let’s face it, you startup founders lead a very busy life and easily fall prey to the “Everything or Nothing” syndrome in which you focus all your energy on one project and usually overlook fitness. Let’s then get started with a general health-up diet plan before proceeding on to the more specialised dietary programs focused on specific groups of food. 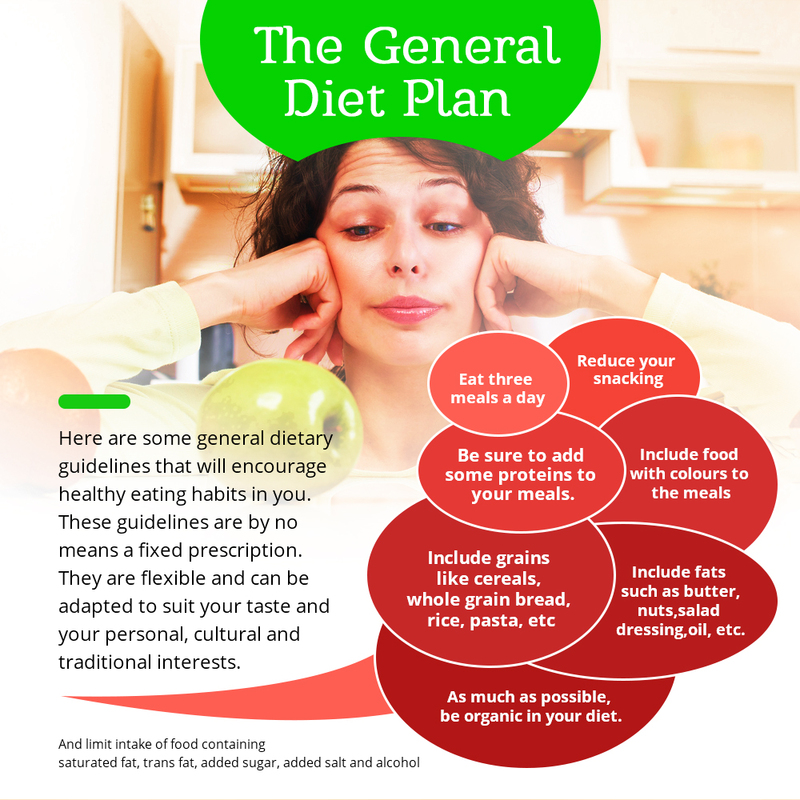 Here are some general dietary guidelines that will encourage healthy eating habits in you. These guidelines are by no means a fixed prescription. They are flexible and can be adapted to suit your taste and your personal, cultural and traditional interests. Be sure to add some proteins to your meals. Include food with colours to the meals. Include grains like cereals, whole grain bread, rice, pasta, etc. Include fats such as butter, nuts, salad dressing, oil, etc. As much as possible, be organic in your diet. And limit intake of food containing saturated fat, trans fat, added sugar, added salt and alcohol. 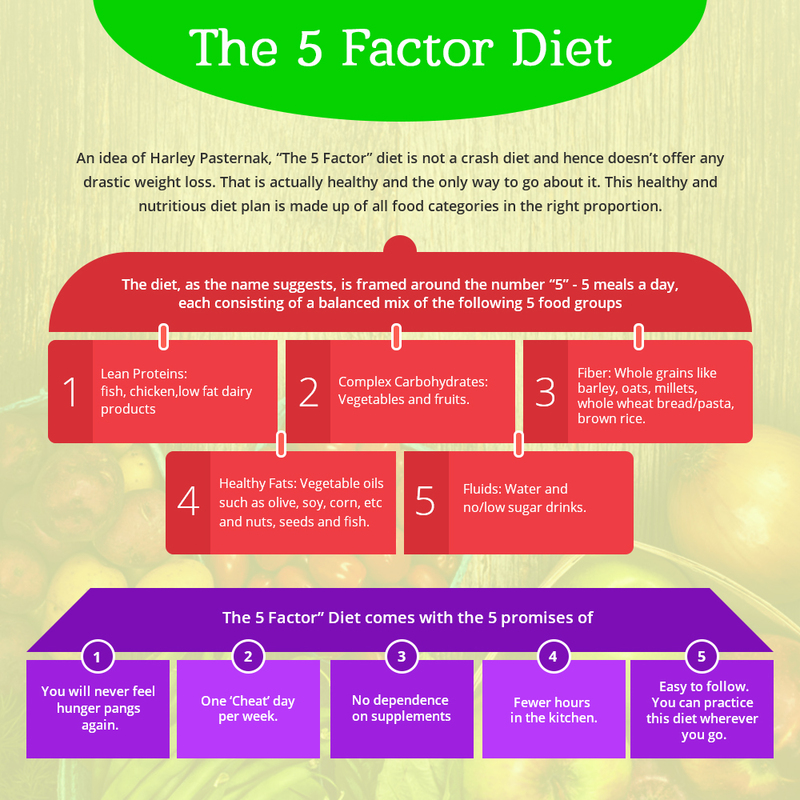 An idea of Harley Pasternak, “The 5 Factor” diet is not a crash diet and hence doesn’t offer any drastic weight loss. That is actually healthy and the only way to go about it. This healthy and nutritious diet plan is made up of all food categories in the right proportion. Lean Proteins: fish, chicken, low fat dairy products. Complex Carbohydrates: Vegetables and fruits. Fiber: Whole grains like barley, oats, millets, whole wheat bread/pasta, brown rice. Healthy Fats: Vegetable oils such as olive, soy, corn, etc and nuts, seeds and fish. Fluids: Water and no/low sugar drinks. You will never feel hunger pangs again. One ‘Cheat’ day per week. Fewer hours in the kitchen. Easy to follow. You can practice this diet wherever you go. This high fat, low carb diet is a great way to stay in shape and is based on the principle that when your body is in the carb-burning mode, it will burn all available carbs for energy before starting on stored fats. 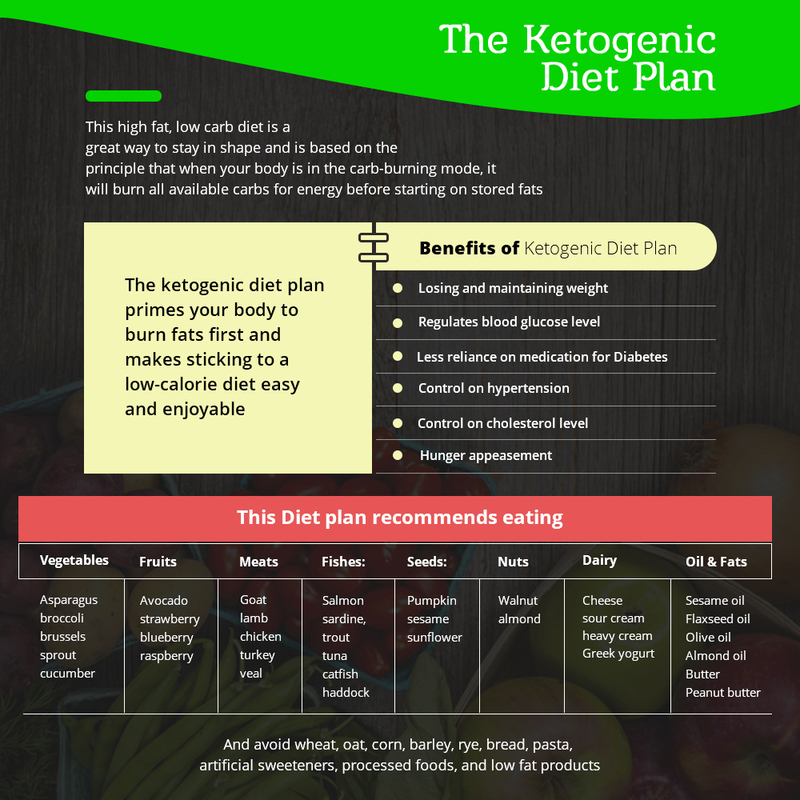 The ketogenic diet plan primes your body to burn fats first and makes sticking to a low-calorie diet easy and enjoyable. Less reliance on medication for Diabetes. Vegetables: Asparagus, broccoli, brussels sprout, cucumber. Fruits: Avocado, strawberry, blueberry, raspberry. Meats: Goat, lamb, chicken, turkey, veal. Fishes: Salmon, sardine, trout, tuna, catfish, haddock. Dairy: Cheese, sour cream, heavy cream, Greek yogurt. Oil & Fats: Sesame oil, Flaxseed oil, Olive oil, Almond oil, Butter, Peanut butter. And avoid wheat, oat, corn, barley, rye, bread, pasta, artificial sweeteners, processed foods, and low fat products. 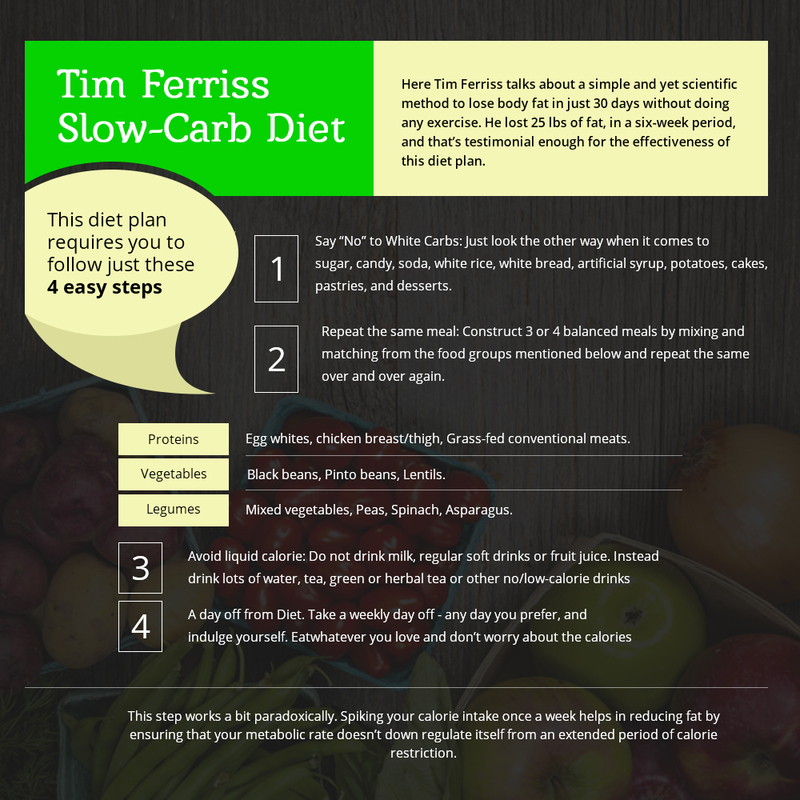 Here Tim Ferriss talks about a simple and yet scientific method to lose body fat in just 30 days without doing any exercise. He lost 25 lbs of fat, in a six-week period, and that’s testimonial enough for the effectiveness of this diet plan. Say “No” to White Carbs: Just look the other way when it comes to sugar, candy, soda, white rice, white bread, artificial syrup, potatoes, cakes, pastries, and desserts. Repeat the same meal: Construct 3 or 4 balanced meals by mixing and matching from the food groups mentioned below and repeat the same over and over again. 2.1 Proteins: Egg whites, chicken breast/thigh, Grass-fed conventional meats. 2.2 Legumes: Black beans, Pinto beans, Lentils. 2.3 Vegetables: Mixed vegetables, Peas, Spinach, Asparagus. Avoid liquid calorie: Do not drink milk, regular soft drinks or fruit juice. Instead drink lots of water, tea, green or herbal tea or other no/low-calorie drinks. A day off from Diet. Take a weekly day off – any day you prefer, and indulge yourself. Eat whatever you love and don’t worry about the calories. This step works a bit paradoxically. Spiking your calorie intake once a week helps in reducing fat by ensuring that your metabolic rate doesn’t down regulate itself from an extended period of calorie restriction. Most of us tend to overlook the pH (potential of hydrogen) factor, the measure of acidity or alkalinity, of our body’s fluids and tissues. A proper pH plays an important part in your health. It is said that diseases and disorders are not found in a body whose pH level is in balance. 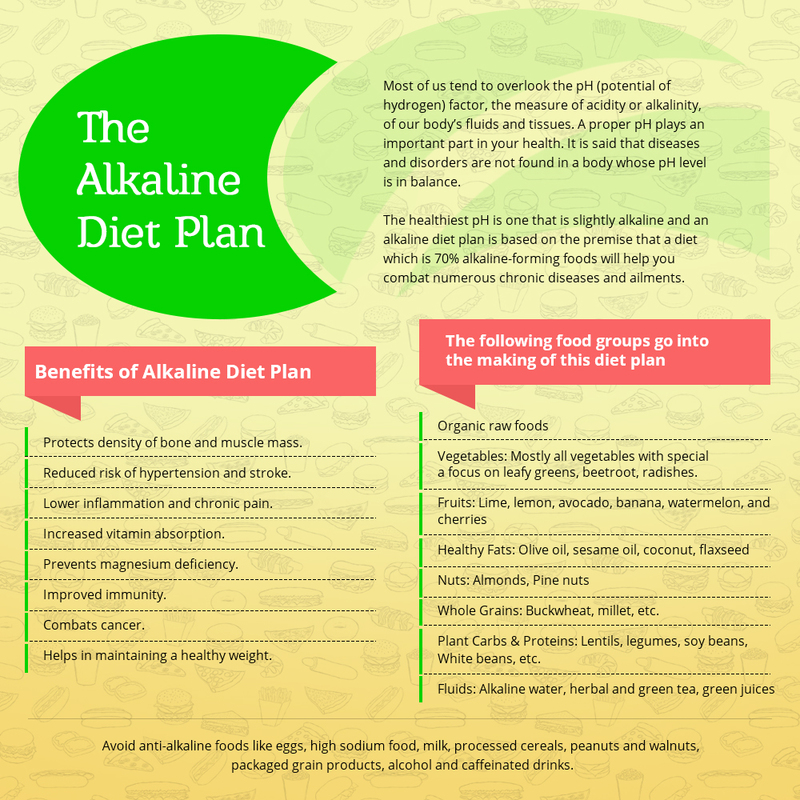 The healthiest pH is one that is slightly alkaline and an alkaline diet plan is based on the premise that a diet which is 70% alkaline-forming foods will help you combat numerous chronic diseases and ailments. Protects density of bone and muscle mass. Reduced risk of hypertension and stroke. Lower inflammation and chronic pain. Helps in maintaining a healthy weight. Vegetables: Mostly all vegetables with special a focus on leafy greens, beetroot, radishes. Fruits: Lime, lemon, avocado, banana, watermelon, and cherries. Healthy Fats: Olive oil, sesame oil, coconut, flaxseed. Whole Grains: Buckwheat, millet, etc. Plant Carbs and Proteins: Lentils, legumes, soy beans, White beans, etc. Fluids: Alkaline water, herbal and green tea, green juices. Avoid anti-alkaline foods like eggs, high sodium food, milk, processed cereals, peanuts and walnuts, packaged grain products, alcohol and caffeinated drinks.